I am very new to CCD-style imaging, and I am using the new ASI071MC-Cool (Color) camera with the Sony IMX071 sensor. Coming from a DSLR background, terms like Gain, Offset, ADU and debayering are new to me. The issue I am having is the color balance of my stacked images coming out of DeepSkyStacker. 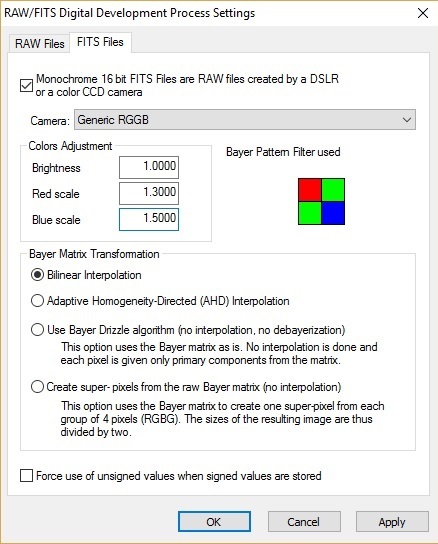 I have set the RAW/FITS Settings to the bayer pattern listed by the camera (In SGP settings): RGGB. There was a previous thread about GBRG being the correct bayer pattern to use, but in my tests that was not the case. The RGGB bayer pattern seems to work best, but the final image color is off. It has a greenish cast and is generally pale. Is not possilbe to balance the levels in PS afterwards either. 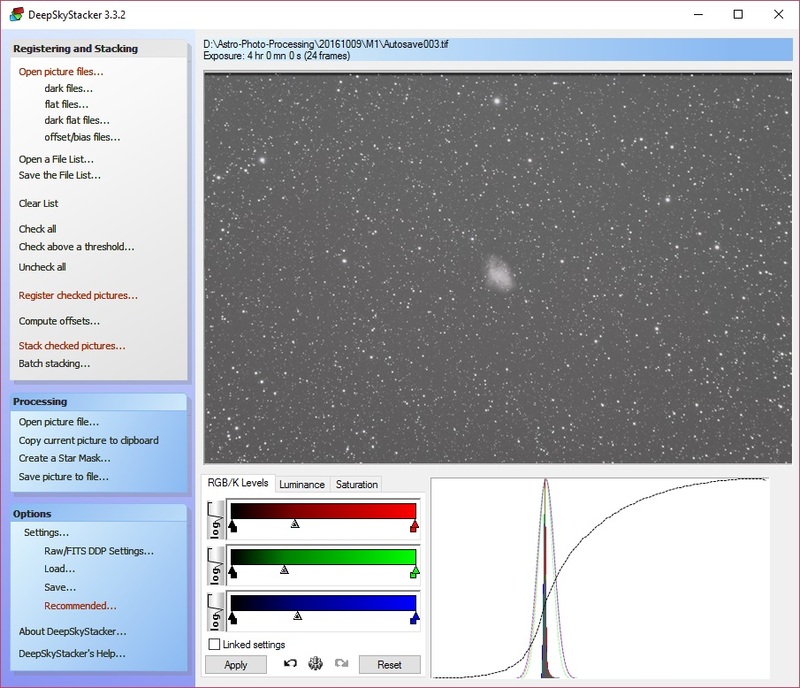 I am using SGP for image acquisition using a various exposure lengths and Gain/Offset values. The camera was not cooled - as I do not have an external power source for the camera yet, but was used in -1 degree C weather. I understand that I can improve the data immensely by using a LP filter and adding flats, but I feel like the color issue is something different. If anyone has any experience with the ASI071MC-Cool (Color) I would greatly appreciate your input! I am happy to elaborate on any details if it helps diagnose the issue. Attached is the best I could process out of the data aquired. I use SharpCap, I did not achieve yet the balance I want to. It depends on your computer monitor too. I do my night balance on the moon : use histogram and overlap all colors. Well, first...as a DSLR user, you should be familiar with all of these things, except maybe offset. Gain is basically the same as ISO on a DSLR. ISO is really just the user-controllable way of changing gain with a DSLR. You can think of Gain on the ASI071 as a very finely-tunable ISO setting. Same basic deal. You should also be very familiar with debayering. DSLR RAW images must be debayered before they can be used, however the same care must be taken with DSLR RAW as with ASI071 fits data. You MUST calibrate the data in either case before you debayer (also called demosaicing). Some tools may handle this for you, such as DSS. With DSS, you just need to set a bayer pattern when integrating FITS data for it to debayer for you. DSLR cameras also have an offset. It is usually a fixed offset. In the case of Canon cameras, it is usually 512 ADU and on some newer Nikons it is 600 (ADU, Analog to Digital Units, the numeric range that the camera ADC outputs. Currently the vast majority of DSLRs and mirrorless cameras are 14-bit, so the numeric range is 0 - (214-1), or 0-16383. Many older Nikons don't use a bias offset, which results in clipped data. This is not a user-configurable option on a DSLR, however it is there. With the ASI071, it's just another user-configurable options much like ISO. To start, you should stick with the default ASCOM driver settings for gain and offset, and you won't really have to worry about either. The RGGB pattern is indeed correct. I, too, have a very strong green color cast. I think that is in part due to the LP (low and high pressure sodium and mercury lighting can lead to greenish gradients) and also in part to the natural sensitivity of the green pixels in this particular sensor (the sensitivity of the green pixel to a fair amount of the NIR range is quite high and broad, which unfiltered can cause an even stronger green color cast). The color cast is most definitely correctable, however. 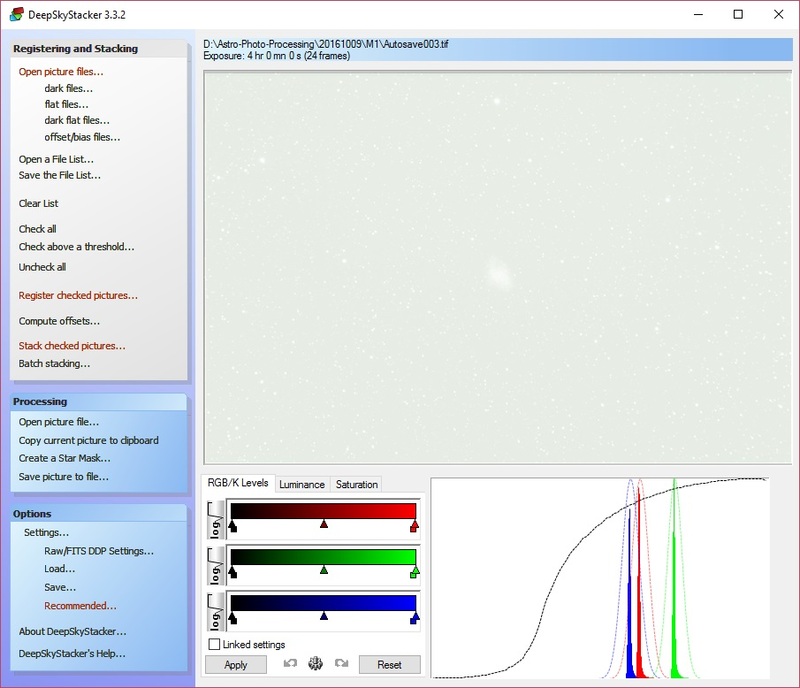 You must properly remove the gradient (in PI, you would use DynamicBackgroundExtraction), and then you must properly neutralize the background and calibrate the white point (you can use PS with some basic layers or curves adjustments to neutralize the background, and eXcalibrator to calibrate the white point to G2V; alternatively in PI you could use BackgroundNeutralization and ColorCalibration to calibrate the color, possibly followed up by SCNR to nuke any remaining color cast). To make sure you are passing only the visible spectrum. Most LP filters will also suffice as a cutoff filter. I recommend the IDAS LPS-D1 for this camera if you want to use an LP filter. Since you are in a red zone, I would start out using the preset low gain (highest dynamic range) setting in the ASCOM driver for this camera. That will set the gain and offset properly, you won't have to worry about them, and it will give you maximum dynamic range. In a red zone, even at this setting, you'll likely only be able to expose for at most a couple of minutes, and by the time you do your read noise will be more than sufficiently swamped. I have found that this camera does need flats, regardless of the lens or scope I use with it. It always seems to have a bit of vignetting, and I'm not exactly sure why, but flats definitely clean it up. Having a flat field is important to being able to properly calibrate the color and stretch the image without running into other issues. b) use RGGB as debayer pattern. to be kept informed, you can ask questions. No need to search and set offset with SharpCap : it does automatically. I can't tell you how incredibly helpful this reply was. That clears things up A LOT for me. I appreciate the time you took to answer each question in terms I could understand! Thank you for the tips!! Especially with the 2" filter. Makes sense considering the size of the sensor on the ASI071. Cheers! I confirm some color issues with my ASI071MC. First : night imaging without IR cut causes grass and bush to become violet. IR cut is mandatory for the color balance. I changed a bit my color balance Red=56 and Blue=80 with Sharpcap for evening artificial light setup. I changed the green color with fitswork4 : green = -25% red, 100% green, 0% blue to adjust. Perhaps not a definitive solution, but the rendering of red hues are better. On many other checks : I couldn't achieve bright/deep red color, maybe a bayer matrix filtering issue. Can you confirm the same issue ? Edited by lylver, 22 March 2017 - 04:58 PM. Ok, I was surprised by the amount of contamination and it was the first time I checked color fidelity so deeply. ASI185MC has a similar QE curves but it was enough corrected for what I did with it. I did not made extensive tests about it, perhaps I should try it on my new red/blue/green lamp led for personnal understanding and quantitizing a corrected matrix. The tech support for the cam could explain what to do more precisely or fix this in driver I suppose, I put a message on ZWO forum. Thanks for the clean historical explanation. I actually made a slight mistake before. You said that some green light was contaminating your image. Technically speaking, it was actually RED light that was contaminating your green pixels. ;P That would add the color "green" to your image, even though all the light was from a narrow band red emission. So it's really the red plot on that chart you want to look at...and yes, the red definitely contaminates both the greens (note that at the 590nm line, where the red and green channels meet, the red transmission level is about 70%! It doesn't drop to 10% until about 565nm, and it remains between 5-10% throughout the rest of the "greens". It also adds some blue light as well, although definitely not as much. 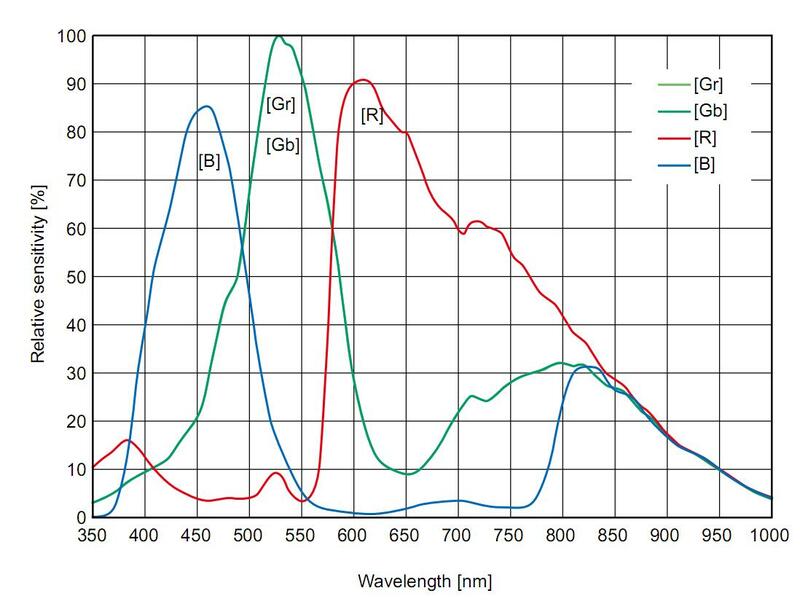 So yes...your pure-red narrow band LED lamp is indeed adding signal to the green pixels, which is where the unwanted green signal is coming from. Such is the sad reality of OSC cameras. Color purity can be a real problem. This is one of the reasons I was eager to get off my DSLRs. They are no better, and some are worse than the ASI071. yes Jon, red to green, no problem, just an opportunity test while thinking at the subject we started. For the records, I hesitated about this in December. Between the two possibilities : ASI1600 mono + filter or the ASI071, i choosed ASI071 because of pixel sized matching with my future f/D=8 scope and the nikon historical use of this sensor. And also to do nature and birding daylight imaging. Anyway, after balancing pro and cons, I still prefer direct imaging, it is for pleasure before maximum quality. Imaging with a mono cam and filter wheel is more sensitive to wheather conditions. 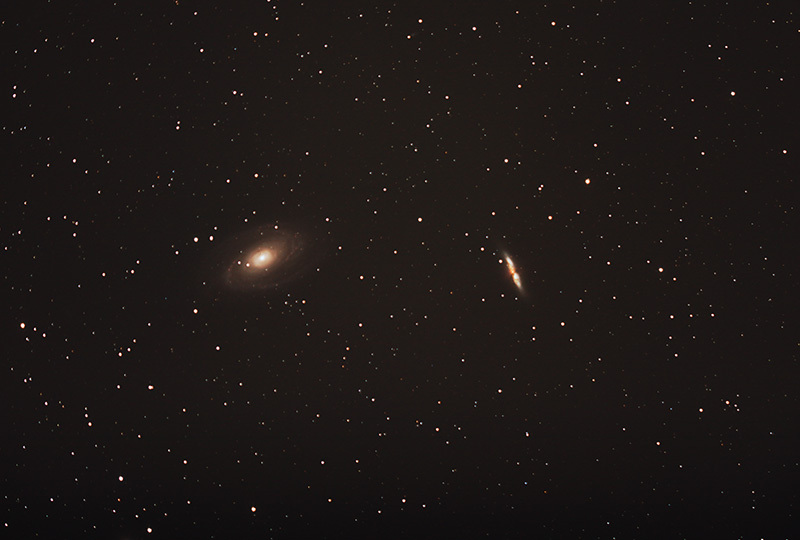 As I have an unspecialized 80mm f/D=6, exposures are a bit long for DSO. I will manage the issue with post-processing and/or wait for support. Perhaps later with time and better scope and accessories, I will shift to the sharper method of imaging. Lets go step by step. lylver, if you can figure out the proper matrix transformation for the Nikon D7100, you could probably apply it to the ASI071 as well. That would redistribute the color information mathematically (you would have to do it on the final integration, not the individual subs), and give you better results. A member on these forums, Sharkmelly (spends most of his time in the DSLR forum) did some research on this subject maybe a year ago. He has a thread in the DSLR forum that covers the math, and it can be applied in PixInsight with PixelMath pretty easily. You can probably find the right information on DXOMark's 7100D review. Or after stacking you can move the sliders to get all 3 color channels aligned. Misalligned colors with a green cast. Color channels aligned and green cast is gone. I found this not to be the case with my ASI1600MC-Cool and the ASI071. This D1 filter was designed for modified DSLRs as per Hutech and they suppress the Red/IR starting at 650nm where the P2 model clips at 700nm. I feel the Idas P2 is a better choice for these two ASI cameras. Edited by DonBoy, 23 March 2017 - 11:30 AM. The slight suppression of the ultra deep reds is the point, though. These OSC cameras can be very sensitive to the reds (which is the case with this camera, if you look at it's filter bandpass chart: https://astronomy-im.../ASI071-QE.jpg; Note how broad the read pass is.) The thing about an IDAS LPS-D1 over an IDAS LPS-P2 is that it DOES cut off a little bit of the deep reds (however, it still passes Ha, NII and SII, so you'll still get the key red emissions from emission nebula), so they don't become so overpowering of the other colors. Personally, I actually liked imaging with my unmodded 5D III, as it helped me preserve the other colors in my nebula images. I often acquired uniquely colorful images of common objects, that usually end up overpoweringly red with modded DSLRs or OSC cameras. 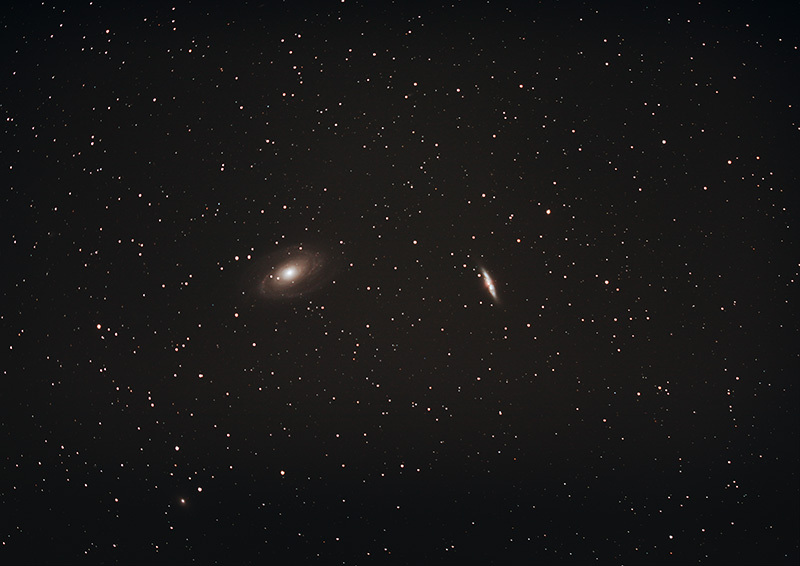 I was surprised last night, I took "terrestrial" pictures with a Wollensak 1/2 inch fl CS-mount lens, reducing image size to 2400x1600 (to remove vignetting). Without adjusting the color balance (50/50) and without IR-cut, I still get good color palette range. They are always odd things when spotting vegetation (violet ...) but for the remaining color fidelity was nice. For AP, you would indeed want to use a UV/IR cutoff filter of some kind, as otherwise you'll never be able to properly focus all the light from stars, and the IR would bloat them. You need to make sure you are cutting off the unnecessary UV and IR light to get good focus when doing AP images. I know Jon, just trying to expose some evidence. Maybe a issue with the color balance due to the IR cut frequency @700nm ? I get the feeling that you are applying daytime photography concepts to AP, which is really just confusing matters. Daytime photography doesn't really have much of anything to do with AP, the two generally play by totally different rulebooks. Thanks Trevor for posting this question and John for your answer. I have been fighting with the 071 as well. I was pleasantly surprised to find this string today. I tried again this week after talking to you and this is what I got out of it. I'm going to try and apply some of those changes John listed here in DSS. Edited by smolony, 24 March 2017 - 04:15 PM. I was speaking about daylight white balance. Trying first to understand how it works. Next I will do my color balance on moon for AP. Perhaps it is not the good way to do but, for my eyes, it gives good colors. I just want to go further with your information about the built in matrix. The seconds appears more vivid : the sun was shining. First picture appeared flat and grey shaded, in second one stone with brown earth, green trees, global shinny appearance etc. Matrix is not mandatory, but now I understand better the color impurity due to those integrated bayer matrix. Edited by lylver, 26 March 2017 - 11:12 AM. I took pictures, verifying histogram (main illumination between 70% and 90%), I was badly surprised by native color rendition. First line is native cam rendering, second line is after a corrective matrix I refined. This is a sort of color shift formula to obtain the right yellow (main goal), cyan (does'n agree with fraunhofer chart but visually not far for me as a sort of deep green/blue), violet/deep red hues that is so joyfull to eye. Edited by lylver, 08 April 2017 - 03:57 AM.